Our "restaurant in hangar 10" is open for you daily from 9:00 to 18:00. It is centrally located on the museum grounds between the historic Lille Hall and the Space Flight Hall. In addition to the 330 seats indoors, dining and beverages can also be had in a generous outdoor terrace with a breath-taking view of the museum exhibits. From 9:00 to 11:00 you can nourish yourself with breakfast for your museum visit, and between 11:00-18:00 we offer you warm snacks. The "restaurant in hangar 10" is accessible to the handicapped and is child-friendly. 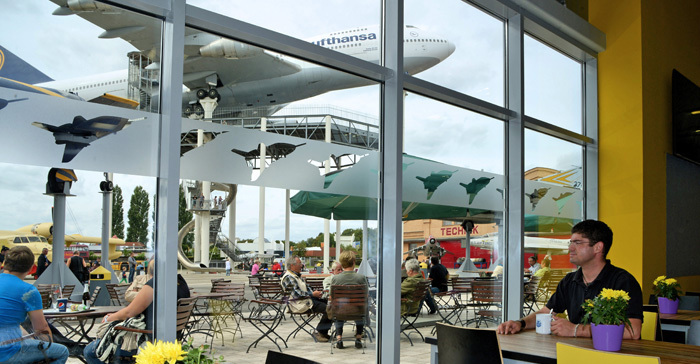 In the outdoor area in front of the main entrance to the Technik Museum Speyer, from spring to autumn we offer a beer garden and our lunch, with a modest but fine menu. The beer garden, as well as the associated playground with its many playing options, can be visited independently of the museum. Tip: For groups, (vintage car) clubs and school classes, we offer special packages that combine museum entrance with a delicious lunch.